Pythagoras represents the Eternal Pilgrim for PHILOSOPHIA PERENNIS – the perennial philosophy of life. He is a seeker of truth par excellence. He staked all that he had for the search. He travelled far and wide, almost the whole known world of those days, in search of the Masters, of the mystery schools, of any hidden secrets. From Greece he went to Egypt – in search of the lost Atlantis and its secrets. In Egypt, the great library of Alexandria was still intact. It had all the secrets of the past preserved. It was the greatest library that has ever existed on the earth; later on it was destroyed by a Mohammedan fanatic. The library was so big that when it was burnt, for six months the fire continued. Just twenty-five centuries before Pythagoras, a great continent, Atlantis, had disappeared into the ocean. The ocean that is called ‘Atlantic’ is so called because of that continent, Atlantis. Atlantis was the ancient most continent of the earth, and civilization had reached the highest possible peaks. But whenever a civilization reaches a great peak there is a danger: the danger of falling apart, the danger of committing suicide. Humanity is facing that same danger again. When man becomes powerful, he does not know what to do with that power. When the power is too much and the understanding is too little, power has always proved dangerous. Atlantis was not drowned in the ocean by any natural calamity. It was actually the same thing that is happening today: it was man’s own power over nature. It was through atomic energy that Atlantis was drowned – it was man’s own suicide. But all the scriptures and all the secrets of Atlantis were still preserved in Alexandria. All over the world there are parables, stories, about the great flood. Those stories have come from the drowning of Atlantis. All those stories – Christian, Jewish, Hindu – they all talk about a great flood that had come once in the past and had destroyed almost the whole civilization. Just a few initiates, adepts, had survived. Noah is an adept; a great Master, and Noah’s ark is just a symbol. A few people escaped the calamity. With them, all the secrets that the civilization had attained survived. They were preserved in Alexandria. Pythagoras lived in Alexandria for years. He studied; he was initiated into the mystery schools of Egypt – particularly the mysteries of Hermes. Then he came to India, was initiated into all that the brahmins of this ancient land had discovered, all that India had known in the inner world of man. For years he was in India, then he travelled to Tibet and then to China. That was the whole known world. His whole life he was a seeker, a pilgrim, in search of a philosophy – philosophy in the true sense of the word: love for wisdom. He was a lover, a philosopher – not in the modern sense of the word but in the old, ancient sense of the word. Because a lover cannot only speculate, a lover cannot only think about truth: a lover has to search, risk, adventure. Truth is the beloved. How can you go on only thinking about it? You have to be connected with the beloved through the heart. The search cannot be only intellectual; it has to be deep down intuitive. Maybe the beginning has to be intellectual, but only the beginning. Just the starting point has to be intellectual, but finally it has to reach the very core of your being. He was one of the most generous of men, most liberal, democratic, unprejudiced, open. He was respected all over the world. From Greece to China he was revered. He was accepted in every mystic school; with great joy he was welcomed everywhere. His name was known in all the lands. Wherever he went he was received with great rejoicing. Even though he had become enlightened, he still continued to reach into hidden secrets; he still continued to ask to be initiated into new schools. He was trying to create a synthesis; he was trying to know the truth through as many possibilities as is humanly possible. He wanted to know truth in all its aspects, in all its dimensions. He was always ready to bow down to a Master. He himself was an enlightened man – it is very rare. Once you have become enlightened, the search stops, the seeking disappears. There is no point. Buddha became enlightened… then he never went to any other Master. Jesus became enlightened… then he never went to any other Master. Or Lao Tzu, or Zarathustra, or Moses…. Hence Pythagoras is something unique. No parallel has ever existed. Even after becoming enlightened, he was ready to become a disciple to anybody who was there to reveal some aspect of truth. His search was such that he was ready to learn from anybody. He was an absolute disciple. He was ready to learn from the whole existence. He remained open, and he remained a learner to the very end. The whole effort was… and it was a great effort in those days, to travel from Greece to China. It was full of dangers. The journey was hazardous; it was not easy as it is today. Today things are so easy that you can take your breakfast in New York and your lunch in London, and you can suffer indigestion in Poona. Things are very simple. In those days it was not so simple. It was really a risk; to move from one country to another country took years. By the time Pythagoras came back, he was a very old man. But seekers gathered around him; a great school was born. And, as it always happens, the society started persecuting him and his school and his disciples. His whole life he searched for the perennial philosophy, and he HAD found it! He gathered all the fragments into a tremendous harmony, into a great unity. But he was not allowed to work it out in detail; to teach people he was not allowed. He was persecuted from one place to another. Many attempts were made on his life. It was almost impossible for him to teach all that he had gathered. And his treasure was immense – in fact, nobody else has ever had such a treasure as he had. But this is how foolish humanity is, and has always been. This man had done something impossible: he had bridged East and West. He was the first bridge. He had come to know the Eastern mind as deeply as the Western mind. He was a Greek. He was brought up with the Greek logic, with the Greek scientific approach, and then he moved to the East. And then he learnt the ways of intuition. Then he learnt how to be a mystic. He himself was a great mathematician in his own right. And a mathematician becoming a mystic is a revolution, because these are poles apart. The West represents the male mind, aggressive intellect. The East represents the female mind, receptive intuition. East and West are not just arbitrary – the division is very, very significant and profound. And you should not forget Rudyard Kipling: what he said has significance, has meaning. He says East and West shall never meet. There is a fragment of truth in it, because the meeting seems to be impossible; the ways of their working are so diametrically opposite. The West is aggressive, scientific, ready to conquer nature. The East is non-aggressive, receptive – Ready to be conquered by nature. The West is eager to know. The East is patient. The West takes every initiative to reach into the mysteries of life and existence; it tries to unlock the doors. And the East simply waits in profound trust: “Whenever I am worthy, the truth will be revealed to me.” The West is concentration of the mind: the East is meditation of the mind. The West is thinking: the East is non-thinking. The West is mind: the East is no-mind. And Kipling seems to be logically right, that it seems impossible that East and West could ever meet. And ‘the East and the West’ does not only represent the earth being divided in two hemispheres: it represents your mind too, your brain too. Your brain is also divided in two hemispheres just like the earth. Your brain has an East in it and a West in it. The left-side hemisphere of your brain is the West; it is connected with the right hand. And the right-side hemisphere of your brain is the East; it is connected with the left hand. The West is rightist. The East is leftist. And the processes of both are so different…. The left hemisphere of your mind calculates, thinks, is logical. All science is produced by it. And the right hemisphere of your brain is a poet, is a mystic. It intuits, it feels. It is vague, cloudy, misty. Nothing is clear. Everything is a kind of chaos, but that chaos has its beauty. There is great poetry in that chaos; there is great song in that chaos. It is very juicy. The calculative mind is a desert like phenomenon. And the non-calculative mind is a garden. Birds sing there and flowers bloom… it is a totally different world. Pythagoras was the first man to try the impossible, AND he succeeded! In him, East and West became one. In him, yin and yang became one. In him, male and female became one. He was an Ardhanarishwar – a total unity of the polar opposites. Shiva and Shakti together. Intellect of the highest caliber and intuition of the deepest caliber. Pythagoras is a peak, a sunlit peak, and a deep, dark valley too. It is a very rare combination. But his whole life’s effort was destroyed by the stupid people, by the mediocre masses. These few verses are the only contribution left. These verses can be written on one postcard. This is all that is left of that great man’s effort, endeavour. And this too is not written by his own hand; it seems all that he had written was destroyed. The day Pythagoras died; thousands of his disciples were massacred and burnt. Only one disciple escaped the school; his name was Lysis. And he escaped, not to save his life – he escaped just to save something of the Master’s teachings. These Golden Verses of Pythagoras were written by Lysis, the only disciple who survived. The whole school was burnt, and thousands of disciples were simply murdered and butchered. And all that Pythagoras had accumulated on his journeys – great treasures, great scriptures from China, India, Tibet, Egypt, years and years of work – all was burnt. Lysis wrote these few verses. And, as it has been the ancient tradition that a real disciple knows no other name than his Master’s, these verses are not called LYSIS’ VERSES – they are called The Golden Verses of Pythagoras. He has not written his name on them. This has been happening again and again. It happened with Vyasa in India, a great Master. In his name there are so many scriptures that it is impossible that one man could write so many scriptures. It is humanly impossible. Even if one thousand persons wrote their whole lives continuously, then too so many scriptures could not be written. Then what happened? They are all authored by Vyasa – they are not all written by Vyasa but by his disciples. But the real disciple knows no other name than his Master’s. He has disappeared in the Master, so whatsoever he writes, he writes in the name of the Master. So many theories have been evolved by linguists, by scholars, by professors – they think there have been so many Vyasas, many people of the same name. That is all nonsense. There has been only one Vyasa. But down the centuries many people loved him so deeply that when they wrote something, they felt it was the Master writing through them – they signed the Master’s name because they were only vehicles, just instruments, mediums. The same happened in Egypt to Hermes: many scriptures, all written by the disciples. And the same happened with Orpheus in Greece, and the same with Lao Tzu in China and Confucius in China. The disciple loses his identity. He becomes utterly one with the Master. But something of immense value has been destroyed by the stupidity of people. Pythagoras is the first experiment in creating a synthesis. Twenty-five centuries have passed since then and nobody else has tried it again. Nobody else before had done it, and nobody else has done it afterwards either. It needs a mind which is both – scientific and mystic. It is a rare phenomenon. It happens once in a while. There have been great mystics – Buddha, Lao Tzu, Zarathustra. And there have been great scientists – Newton, Edison, Einstein. But to find a man who is at home with both worlds, easily at home, is very difficult. Pythagoras is that kind of man – a class unto himself. He cannot be categorized by anybody else. The synthesis that he tried was needed, particularly in his days, as it is needed today – because the world is again at the same point. The world moves in a wheel. The Sanskrit word for ‘the world’ is samsara. Samsara means the wheel. The wheel is big: one circle is completed in twenty-five centuries. Twenty-five centuries before Pythagoras, Atlantis committed suicide – out of man’s own scientific growth. But without wisdom, scientific growth is dangerous. It is putting a sword in the hands of a child. Now twenty-five centuries have passed since Pythagoras. Again the world is in a chaos. Again the wheel has come to the same point – it always comes to the same point. It takes twenty-five centuries for this moment to happen. After each twenty-five centuries the world comes into a state of great chaos. Man becomes uprooted, starts feeling meaningless. All the values of life disappear. A great darkness surrounds. Sense of direction is lost. One simply feels accidental. There seems to be no purpose, no significance. Life seems to be just a by-product of chance. It seems existence does not care for you. It seems there is no life after death. It seems whatsoever you do is futile, routine, mechanical. All seems to be pointless. These times of chaos, disorder, can either be a great curse, as it happened in Atlantis, or they can prove a quantum leap in human growth. It depends on how we use them. It is only in such great times of chaos that great stars are born. Pythagoras was not alone. In Greece, Pythagoras and Heraclitus were born. In India, Buddha and Mahavira and many others. In China, Lao Tzu, Chuang Tzu, Confucius, Mencius, Lieh Tzu, and many more. In Iran, Zarathustra. In the brahmin tradition, many great Upanishadic seers. In the world of Judaism, Moses…. All these people, these great Masters were born at a certain stage in human history – twenty-five centuries ago. Now we are again in a great chaos, and man’s fate will depend on what we do. Either we will destroy ourselves like the civilization that destroyed itself in Atlantis – the whole world will become a Hiroshima; we will be drowned in our own knowledge; in our own science we will commit suicide, a collective suicide. A few, a Noah and a few of his followers, may be saved, or may not be…. Or, there is a possibility that we can take a quantum leap. Either man can commit suicide, or man can be reborn. Both doors are open. If such times can create people like Heraclitus and Lao Tzu and Zarathustra and Pythagoras and Buddha and Confucius, why can they not create a great humanity? They can. But we go on missing the opportunity. The ordinary masses live in such unconsciousness that they can’t see even a few steps ahead. They are blind. And they are the majority! The coming twenty-five years, the last part of this century, is going to be of immense value. If we can create a great momentum in the world for meditation, for the inward journey, for tranquility, for stillness, for love, for God… if we can create a space in these coming twenty-five years for God to happen to many, many people, humanity will have a new birth, a resurrection. A new man will be born. And once you miss THESE times, then for twenty-five centuries again you will remain the same. A few people will achieve enlightenment, but it will remain only for a few people. Here and there, once in a while, a person will become alert and aware and divine. But the greater part of humanity goes on lagging behind – in darkness, in utter darkness, in absolute misery. The greater part of humanity goes on living in hell. But these moments when chaos spreads and man loses his roots in the past, becomes unhinged from the past, are great moments. If we can learn something from the past history, if we can learn something from Pythagoras…. People could not use Pythagoras and his understanding, they could not use his great synthesis, they could not use the doors that he had made available. A single individual had done something immense, something impossible, but it was not used. I am trying to do exactly the same again; I feel a very deep spiritual affinity with Pythagoras. I am also bringing you a synthesis of East and West, of science and religion, of intellect and intuition, of the male mind and the female mind, of the head and the heart, of the right and the left. I am also trying in every possible way to create a great harmony, because only that harmony can save. Only that harmony can give you a new birth. But there is every possibility that what was done to Pythagoras will be done to me. And there is every possibility what was done to Pythagoras’ followers will be done to my sannyasins. But still, even knowing that possibility, the effort has to be made again. Because this is a valuable time. It comes only once in twenty-five centuries when the wheel can move in a new way, can take a new direction. You all have to risk, and you have to risk all that you have. And risk it with great joy! because what can be more joyous than to give birth to a new man, to become vehicles for a new man, for a new humanity? My sannyasins can become an energy womb, an energy field. A great synthesis is happening here. East and West ARE meeting here. And if we can make this impossible thing happen, man will live in a totally different way in the future. He will not need to live in the same old hell. Man can live in love, in peace. Man can live in great friendliness. Man can live a life which is nothing but a celebration. Man can make this earth divine. Yes: this very earth can become the paradise and this very body the Buddha. 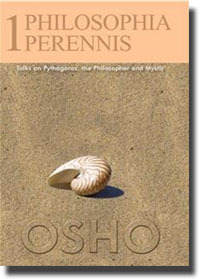 An audio file of this discourse can be downloaded from Osho.com or you can read the entire book online at the Osho Library.